Packed in a "match box"
42 clientes deram a este produto a classificação de 4-estrela. 14 clientes deram a este produto a classificação de 3-estrela. Palhetas excelentes para tocar ritmos e strumming em guitarras elétricas e acústicas. Ótima aderência. Duram bastante tempo, se não as perdermos claro! A no brainer, these picks have been my go-to ever since I bought my first guitar and I cannot overstate how durable and enjoyable they are to play with. 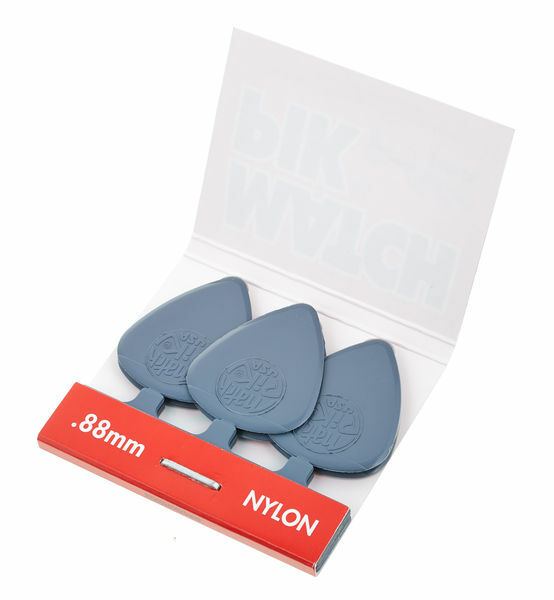 The .88mm thickness means that it's a bit of a jack-of-all-trades sort of pick in my books. They are not very flexible however, so if that is the way you like to groove, I recommend looking at the .70(? )mm ones, or even lower than that if you prefer that sort of thing. The grip is decent thanks to the dunlop logo sort of acting as a... well, grippy surface, the edges do show marks from the molds used to make those picks, but it's nothing that will impair your playing by any stretch of the imagination. And as if by miracle, I feel like it's almost impossible to lose these particular picks. And if you do lose them, they'll come back to you in your sleep. Literally. I'd lost one a couple of years ago and woke up a couple of days later with one of these picks stuck to my forehead. And as all musicians know, a pick that comes back to you is more valuable than any overpriced signature instrument you could ever buy. ID: 204152 © 1996–2019 Thomann GmbH Thomann loves you, because you rock!